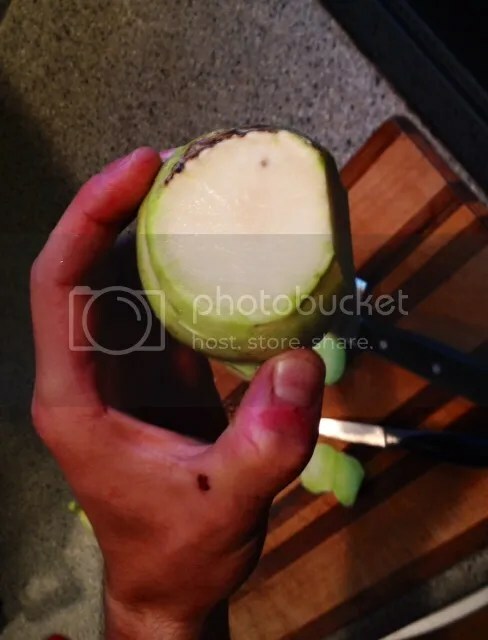 Look closely at the edges of this kohlrabi and you can see it’s thick, fibrous skin. Peel it completely to avoid having tough, stringy chunks in your finished dish. Start by cutting off the ends to get a flat surface. 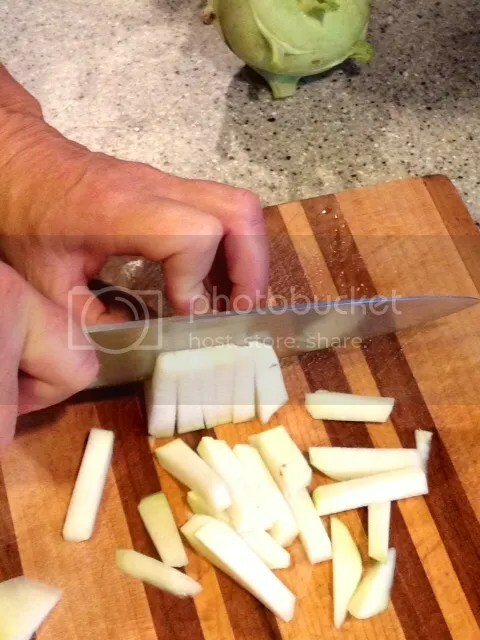 Use a heavy chef’s knife to muscle through the root end, which can be pretty tough. Keep your fingers back! Now peel away the outer flesh. Switch to a small but sturdy–and sharp–paring knife for this job. 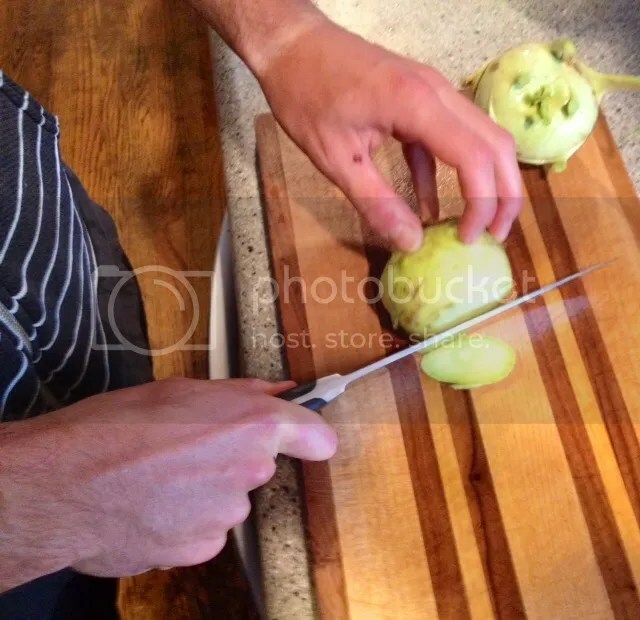 Lay the kohlrabi flat or tilt it at an angle, as pictured, to better cut around the curve of the vegetable. 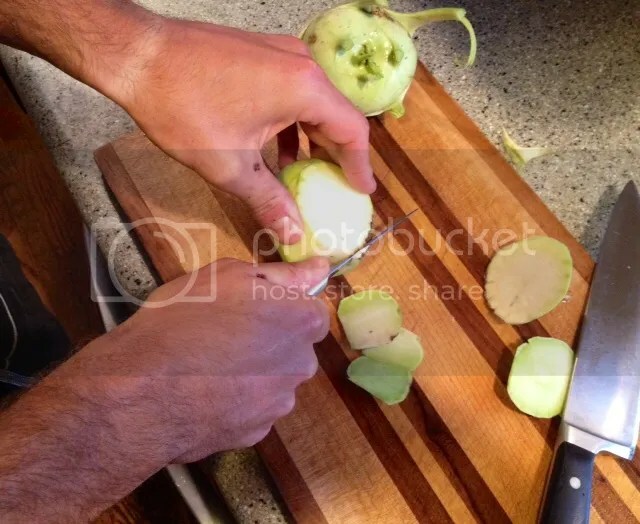 Don’t be surprised if you take off a full 1/8″ of peel–and when there doesn’t seem much left once the kohlrabi is fully prepped. Once peeled, kohlrabi can be cut into matchsticks that are perfect for dipping, stir-frying and making the gratin in the next post. Begin by setting kohlrabi on it’s flat end. Slice vertically into “slabs” about 1/8 to 1/4″ thick. Give the kohlrabi a quarter turn and slice vertically again, about 1/8″ to 1/4″ thick to get a sweet pile of evenly sized matchsticks. Once you’ve prepped it, what can you do with it? Check out the Quick Ideas in the next post or the Slow Cooker Kohlrabi Gratin in the previous post.